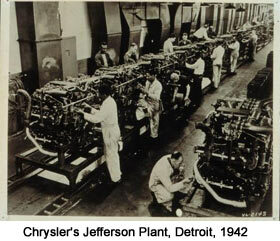 Auburn Hills, MI - Chrysler Group’s Jefferson North Assembly Plant in Detroit, Mich., the birthplace and home of the Jeep® Grand Cherokee, used to be a one-vehicle, three-shift operation. Not anymore. Today, with the implementation of innovative processes and equipment, Jefferson North is ready to build multiple vehicles on the same assembly line, paving a bright future for the plant and its employees. The 2005 Grand Cherokee continues a tradition of Jeep innovation with state-of-the-art technologies, sophisticated all-new Jeep design and the latest in on-road refinement and off-road capability. Delivering exhilarating performance with its 330-horsepower 5.7-liter HEMI® V-8 engine and Multi-Displacement System, the Jeep Grand Cherokee produces up to 20 percent more power, increased fuel efficiency and lower emissions than the previous-generation vehicle. Jefferson North went through a three-week tooling, equipment and manufacturing process changeover this summer, significantly renovating the body and paint shops. As a result, the plant is now equipped with the capability to build multiple models, while simultaneously piloting an additional vehicle. It also has the ability to implement future product introductions with a rolling launch strategy, which minimizes production loss. The launch preparation makeover also enabled engineering, manufacturing and supplier teams to work together at the plant, test-building pilot vehicles on the same assembly line, which helped validate vehicle quality and offered on-the-assembly-line training. In order to launch multiple vehicles at the same plant, in a short span of time, and with less capital investment, Chrysler Group continues to apply a plant asset reutilization strategy. For Jefferson North, the majority of the body shop assets (robotics, tooling, conveyor lines, etc.) were reused, creating a new body shop with existing equipment and within the plant’s current floor plan. As a result, the company was able to redirect millions of dollars towards other projects within the company, rather than tie funds in capital equipment at Jefferson North. Past practices would have called for the removal and scrapping of all equipment for the new model. Jefferson North’s body shop went through an extreme makeover, which required the re-building of the entire operations, in an area of unused white space. Over 200 robots in the existing body shop were refurbished for the launch and approximately 75 percent of the conveyor line system was either modified or replaced. Similar technology and processes used at other Chrysler Group plants that recently launched new vehicles were applied to the facility’s makeover. Paint shop changes also contributed to plant flexibility. The plant launch team added new robotics, especially changing the sprayers in the paint booths to allow for greater coverage of paint on varying body styles. The new technology will also enhance the paint finish on the Grand Cherokee. Adoption of new quality processes and the addition of sound-dampening technology for an improved driving experience were implemented for the 2004 Grand Cherokee and are being carried into the 2005 model year program. A staggered training strategy played a critical role in ensuring high quality levels right out of the launch gate. This approach included early process training with plant employees at Chrysler Group’s pilot operations in Auburn Hills, Mich., as well as extensive training at the plant. It also verified safe operating practices by validating ergonomically related processes that were originally created and tested with digital computer tools. Over 2,500 plant employees benefited from the training. Jefferson North Assembly Plant began production of the all-new 2005 Jeep Grand Cherokee on July 26. The vehicles will arrive at dealerships this fall. For international markets outside of North America, Chrysler Group manufactures Jeep Grand Cherokee at the Magna Steyr Manufacturing Facility in Graz, Austria. Plant History: Facility was built in 1991. Plant produced first Jeep Grand Cherokee in January 1992. Facility was expanded in July 1999.